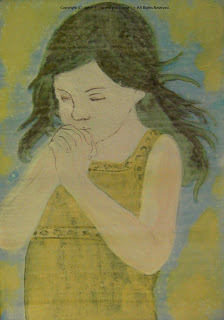 I drew this picture that's name is "Prayer", I used powdered mineral pigments. I love to draw a pure girl. She is 4 years old, and Japaese girl. By the way, thank you for comment! Yeah, Kaii Higashiyama's picture is so cool and beautiful. Oh, I will request a further expression if it says to you so.